Contestants applying for the Miss Teenage Canada contest must be between 13-18 years of age. No you don’t have to be born in Canada, but you must be a Canadian citizen by birth or naturalization, a landed or permanent resident or must show proof of forgoing. I am only 5’3″, and have been told I cannot model, so does that mean I cannot win the title of Miss Teenage Canada? Height has no bearing on the Miss Teenage Canada competition. To us, being 5’1″ is just as beautiful as being 5’11”. This competition it about you shining from the inside out! Former Miss Teenage Canada’s have been 5’2 and 6’0 ! What is a Provincial Title, and what are Regionals? Regionals are the competitions held in each province to select the national delegates who compete for the title of Miss Teenage Canada. A provincial title is awarded to the finalists of each province. For example, titles are awarded to Miss Teenage Alberta, Miss Teenage Winnipeg, Miss Teenage York Region, or Miss Teenage Toronto. Each finalist receives a sash and crown and will reign for one year in her city. There is an entry fee of $600.oo to compete at the Regional Provincial Pageant. Regionals are held in each province to select the national finalists. At the regionals there are several winners, they are called National Finalists. All National Finalists receive a title, sash and crown. Regional pageant delegates must reside within the province they compete in. The Regionals are a two day pageant held over the course of a weekend. The National pageant is one week long and the contestants are all the regional winners from across Canada. The Nationals pageant is where the title Miss Teenage Canada is awarded. How are city titles determined, verses province titles? Titles are awarded according to ranking in the scores and where each finalist resides. Overall winners become Miss Teenage __________ of their province and the remaining finalists’ titles are determined according to where they are located, They are awarded Miss Teenage _____City/County. You do not need experience – that is where the Miss Teenage Canada workshops come in. Competing for a provincial title like Miss Teenage Manitoba has a lot of benefits, and it entirely up to you to determine how much you want to do with your title. There are tons of opportunities that come with a title and if you want to take advantage of it you can; but nothing is mandatory, school is always a priority and exceptional teens have very busy schedules so we make it easy for you. Do I have to be in school? You must be enrolled in or a graduate of Post-Secondary, High School or Elementary School, you can be home-schooled. There are several levels of scoring for the pageant. Each area represents a percentage of your total score. You are judged on your personality, your ability to communicate, stage presence, charm, academics, commitment to the community, beauty, fitness and confidence. We’re looking for delegates who have the “it” factor; they light up a room with their poise and confidence and lead as role models to other youth. A Miss Teenage Canada contestant may not be married, divorced, had a marriage annulled or given birth to a child, and this is a competition for female teenagers. Thats totally fine, you may have an agent for film, television and modeling but you can not be bound by any agreement preventing you from signing and performing the Contestant Contract. We have never had a issue with any agency since we began in 2008. 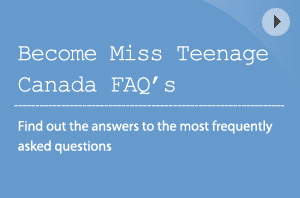 What are the steps I need to take to be Miss Teenage Canada? 2. You will be interviewed to qualify for a provincial pageant via web cam. We want to get to know you, what you stand for, and why you applied to be a part of the pageant. 4. Participate in the national pageant and show us what you’ve got!